Imagine you met someone from France who had never heard of Margaret Thatcher. Think how surreal it would be if someone from such a short distance away had missed one of the most polarising and consequential phenomena on your island in living memory. That’s what it was like on June 9 for people from the island of Ireland to discover that most of the UK knew next to nothing about the DUP. Hastily prepared memes flew around social media. News outlets ran endless ‘Who are the DUP?’ articles. The Huffington Post described them as a ‘fairly unknown’ party. 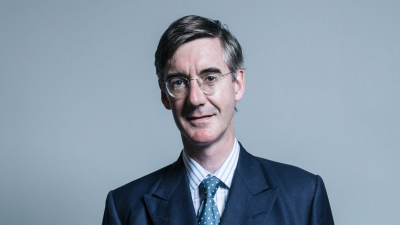 Whether you come from Northern Ireland or the Republic and regardless of your religion or your politics, you’ve heard of the DUP, and not because they’re socially conservative. In recent weeks, much has rightly been made of the DUP’s climate denialism, their anti-choice stance, their opposition to marriage equality, and their rejection of cosmopolitan values. Corbyn supporters gleefully pointed to Tory hypocrisy. Having spent the election campaign lambasting Corbyn for allegedly sympathising with terrorists, the Tories opportunistically courted the support of a party whose membership once overlapped with several loyalist paramilitary groups. Until recently, what made the DUP so infamous on the island of Ireland was little to do with social conservatism. The party’s passionate dedication to Britishness (albeit a form of Britishness more honored in Gibraltar and the Falkland Islands than anywhere in Great Britain), their defence of Ulster Protestantism or their celebration of Unionist culture and tradition are not what made their reputation either. Rather the DUP stands out for their historic and often dogmatic lack of compromise, including in negotiations with the British government. 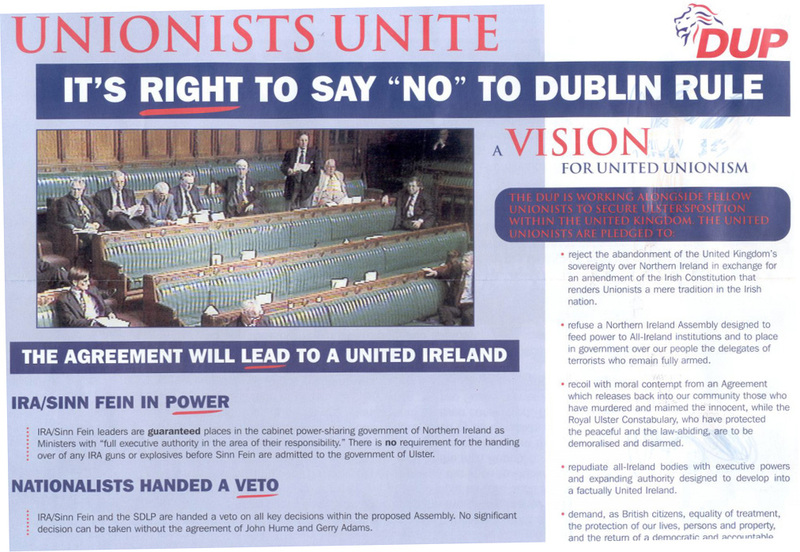 It’s no coincidence that the DUP slogan ‘Ulster says no’ has been parodied so often. For the first thirty years, the DUP rarely felt compelled to offer constructive solutions. Even other unionists characterised the DUP as deeply negative. The party rejected many and varied attempts to resolve the violence in Northern Ireland. They rejected proposals that involved sharing power with republicans. They protested any involvement of the government of the Republican of Ireland in Northern Ireland’s affairs. They campaigned against the Sunningdale Agreement, the Anglo-Irish Agreement, and the Belfast Agreement (better known as the Good Friday Agreement). By insisting on majority-rule and opposing power-sharing, the DUP guaranteed Northern Ireland’s Catholic minority would remain largely excluded from political life. The DUP carried the torch for an anachronistic form of loyalist fundamentalism that saw any accommodation of the Catholic population or the Republic of Ireland as a surrender to papism and a threat to the union. In time, their persistence (and arguably Ian Paisley’s personal magnetism) would drastically shift mainstream unionism, eventually unseating the Ulster Unionist Party as the largest party in Northern Ireland. Ian Paisley established the DUP in 1971. He would go on to lead the party for the next 37 years, bringing them from the fringes to the mainstream. The DUP was originally a response to the civil rights movement, a campaign to end social, employment, education and housing discrimination against Northern Ireland’s Catholic population. Paisley characterised the civil rights movement as republicanism in disguise. The DUP was the only major party in Northern Ireland to campaign against the Good Friday Agreement – the 1998 agreement that ushered in the past two decades of relative peace and prosperity. Following the conclusion of the Good Friday agreement, elections to Northern Ireland’s new Assembly were originally won by more moderate parties like the UUP and the SDLP. When devolved government returned to Northern Ireland after the 2002-2007 suspension, the DUP came into power with Sinn Fein. This was remarkable progress – the thought that these two parties could share power would scarcely have been credible even a decade before. The DUP have normalised if not moderated in recent years, since even before Ian Paisley stepped down as leader. The DUP, perhaps feeling more secure in recent days, have moved on and can no longer be fairly described as a party of obstruction. The time has indeed come to pay more attention to current affairs such as their antiquated social policies or their role in the Brexit referendum than to their anti-peace past. But much of the UK only paid attention to the DUP for the first time on June 9, in much the same way that so little was said or considered about the consequences of a leave vote for Northern Ireland ahead of the Brexit referendum. 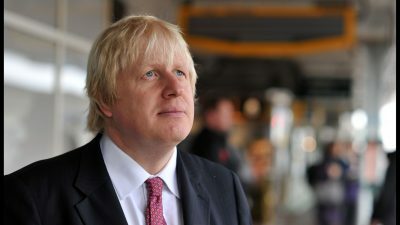 Opinions are mixed on the impact of Brexit or the Tory-DUP partnership on the Northern Ireland peace process. Northern Ireland’s institutions are not in good shape. They came close to collapse in late 2015 and veered further into troubled waters in 2017. The need for a solution to the issue of Northern Ireland’s border with the Republic after the UK leaves the EU will ensure the North remains high on the UK’s agenda for some time. This attention is evidently badly needed. It remains to be seen if Mrs May is making a mistake by negotiating this agenda with the DUP at her side.